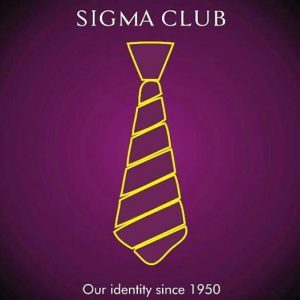 Sigma Club has on Wednesday, 10th April, 2019 released the names of successful applicants for the 2018/2019 Sigma Scholarship Scheme. 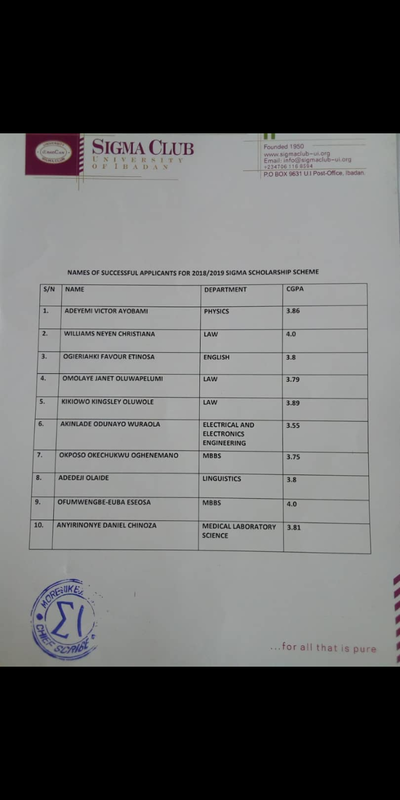 The scholarship scheme was declared open by the Sigma Chief, Mr Valentine Igbonekwu at a press conference held on the 26th February, 2019 at Kuti hall JCR where he said its application is open to all ‘diligent but indigent’ 100 level students of the university and that it will cover the tuition and accommodation fee for their whole year as an undergraduate. The successful applicants are Adeyemi Victor Ayobami from Physics, Williams Neyen Christiana from Law, Ogieriahki Favour Etinosa from English, Omolaye Janet Oluwapelumi from Law, Kikiowo Kingsley Oluwole from Law, Akinlade Odunayo Wuraola from Electrical and Electronics Engineering, Okposo Okechukwu Oghenemano from MBBS, Adedeji Olaide from Linguistic, Ofumwengbe Euba Eseosa from MBBS and Anyirinonye Daniel Chinoza from Medical Laboratory Science. The award ceremony holds tomorrow, Thursday, 11th April, 2019 by 3pm at the Alumni Center, University of Ibadan.